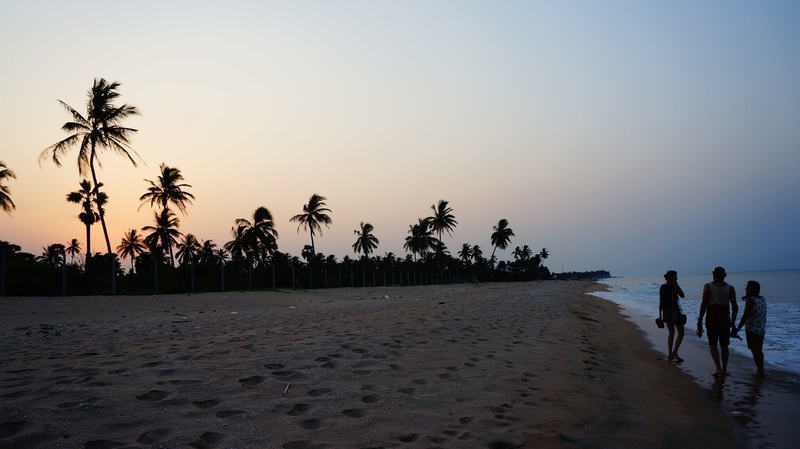 It took almost all day to travel from Jaffna in the north to Nilaveli Beach on the east coast. 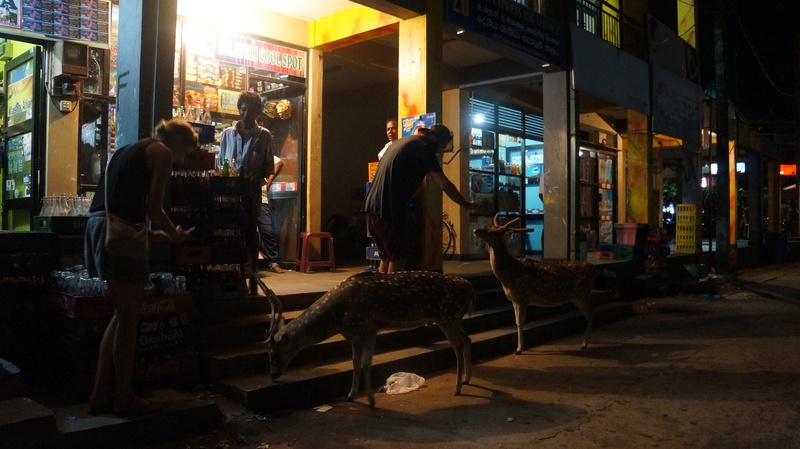 We took a train Jaffna to Vavuniya, then a bus Vavuniya to Trincomelle (where there were an uncanny number of deer hanging out at the bus station) and another bus Trincomelle to Nilaveli beach. Mike is a friend to all the animals. It’s fair to say that we’d probably all had enough by the time we got off the bus on the main road near Nilaveli. It was dark. We hadn’t had dinner. And we still needed to find a place to sleep. We walked backwards and forwards for what seemed like forever looking for somewhere, finally settling on a guesthouse with rat poo everywhere and frogs in Mike and Vic’s room. Great. Girl Power spent the next day resting and eating good food with this guy. He made a cracker rice and curry. It was really good. Really good. 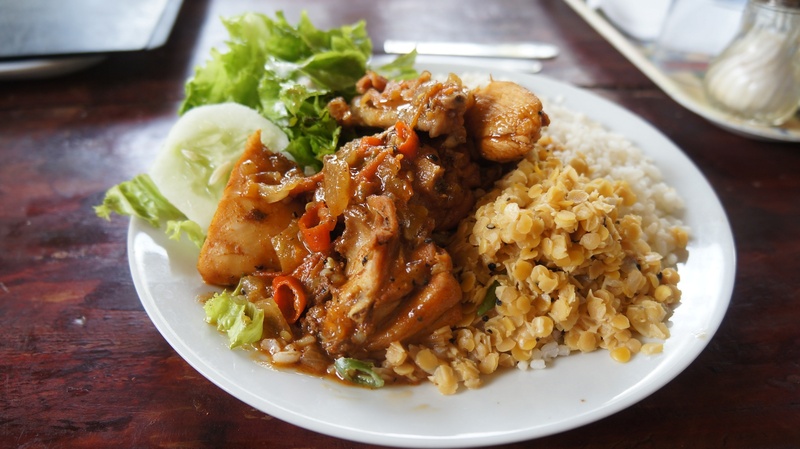 Just like mamma would ‘ave made – if my mamma was Sri Lankan. Which she’s not. She’s from Southland, so that means she cooks a pretty fierce roast. I’d like a roast now. Please. Mum? 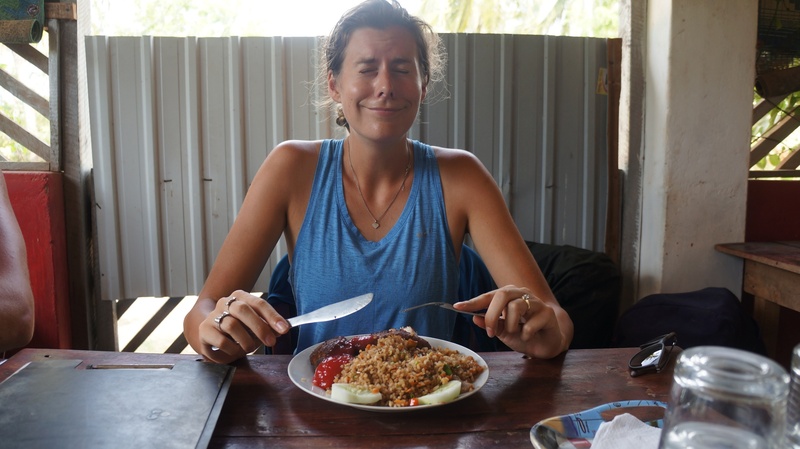 Here is Vic pretending that she’s not sick of fried rice. The boys spend the day drinking beer, playing with a monkey wearing a small pair of pants and charming a snake. True story. That evening we arranged our dive for the next day, strolled the beach and all had another meal at Cafe Nilaveli. Nom nom. Mike and Vic are pretty much pro divers and had it not been for their encouragement, I don’t think I would have been brave enough to dive. 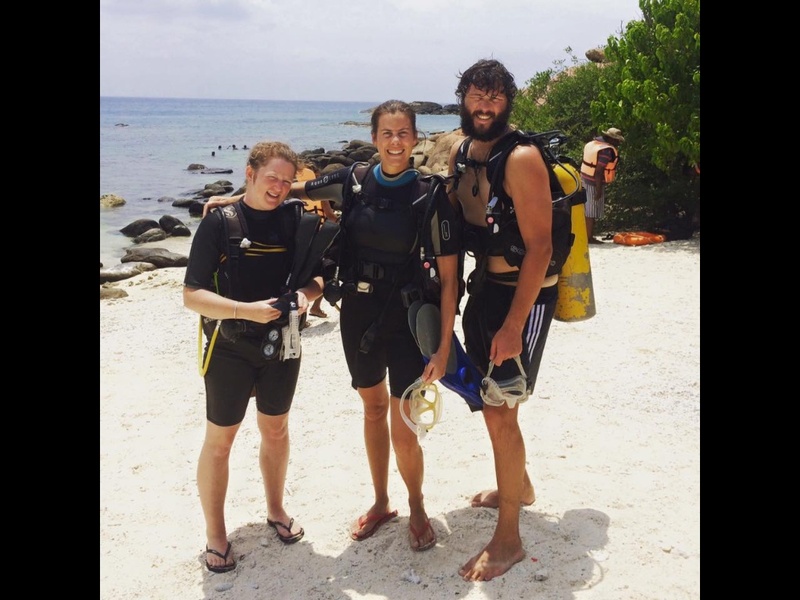 I had an instructor to myself, sometimes two, and I went down to a depth of 10 meters at Pigeon Island. Here we are. Super stoked and with the sun in our peepers. 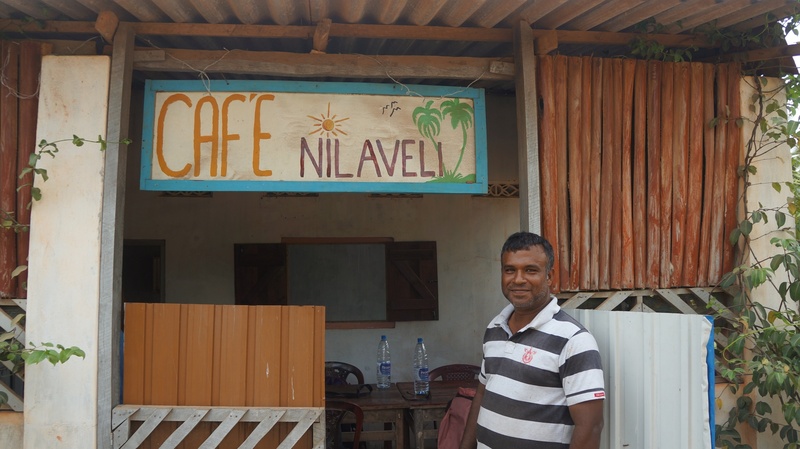 After our dive, we had a late lunch back at our favourite Cafe Nilaveli and made a plan as to what to do next. We decided to split up. They boys would spend one more night in Nilaveli beach and were then to travel south to Arugam Bay tomorrow to meet our friends Ryan and Tom, while the girls would travel back to Trimcomelle, spend one night, catch an early bus to visit Dambula and Sigiriya, stay one or two nights and then travel down to Arugam Bay. Vic and I flagged down a local bus bound for Trincomelle on the main road and got on with our packs. The bus was bursting at the seams. I’m constantly amazed at how many people they can get on these things! We checked into an un-charming and dirty hotel near the bus station, complete with frog in toilet, and ventured out to do what girls love – buy stationary, shampoo and chocolate. We actually bought a really fancy gift box of chocolate and then ate it all. For dinner we had hoppers then got crazy on it and had a cold Milo each. GIRLS ON TOUR! Woooo! At the crack of dawn we were up and on another bus to Sigiriya. We weren’t exactly sure where our stop was so when I thought we were close I went up to the front of the bus where my pack was to talk to the driver so we don’t miss it. Poor Vic though was stranded down the back with her pack on and had to fight her way though the already full aisle of people with it on to make her way to the front door. There was a bit of a hairy moment when an elephant stepped onto the road, the bus braked suddenly and I think I’m going to go flying through the windscreen. But I don’t. I’M ALIVE. And I’ve just seen another elephant! We take a tuk tuk to a guest house that had been recommended to us, get a room, then over lunch discuss how to play out the next few days. Do we spend one or two nights in Sigiriya. It’s still early. We can knock this out in one day easy! $18 NZD is all it cost for us to have a driver and tuk tuk at our disposal for the rest of the day. 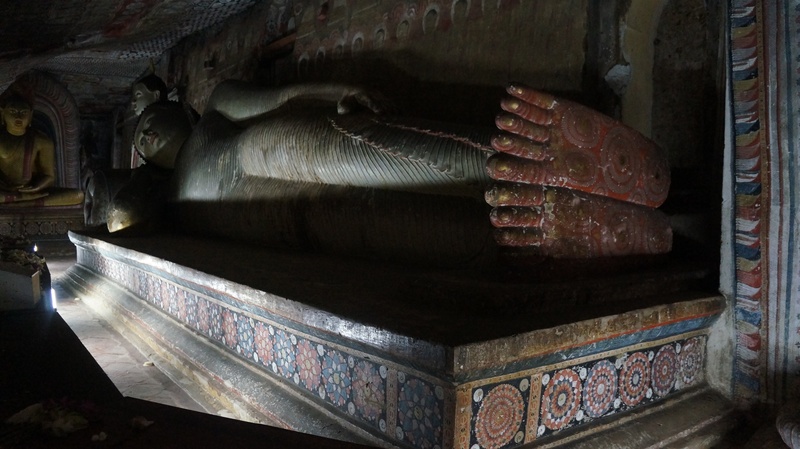 First stop, Dambulla. 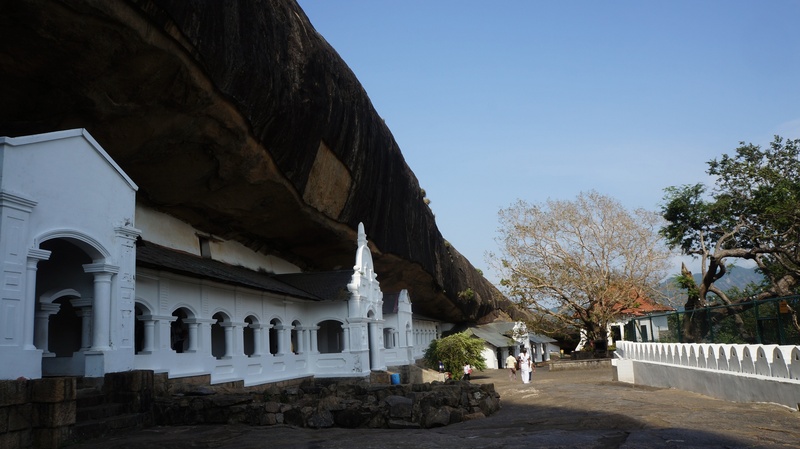 The Dambulla caves are set in a rock that towers 160 m over the surrounding plains. 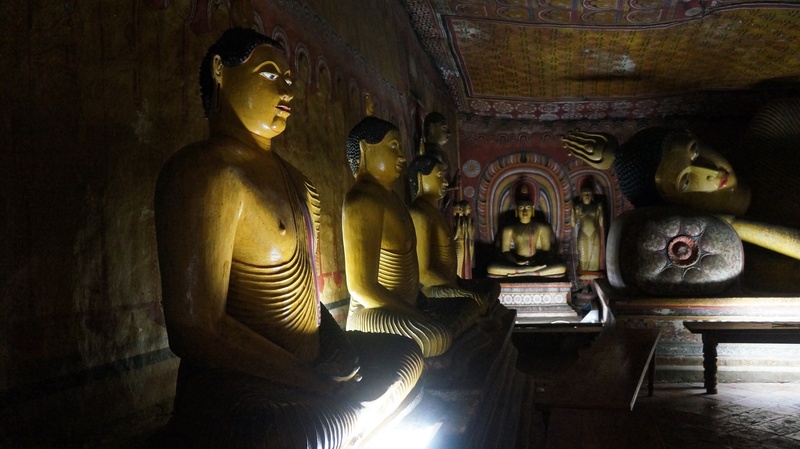 There are five main caves which contain paintings and a total of 153 statues of Buddha. 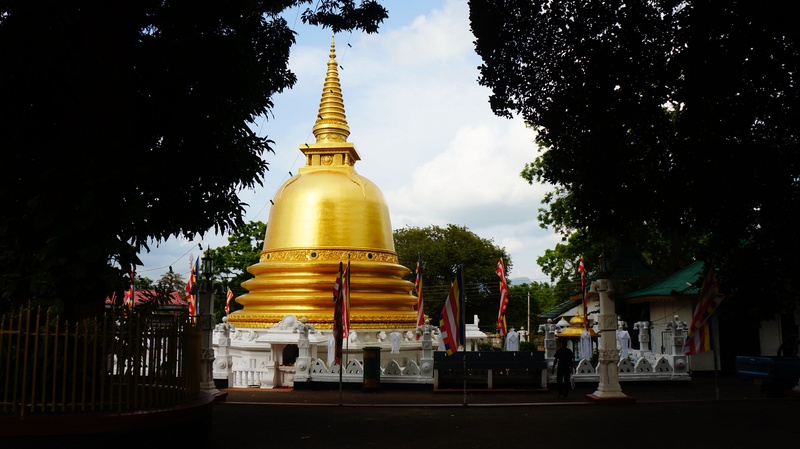 There’s even a nice gold stupa to top things off. While the bus tours flock to Sigiriya and pay $30 USD to climb a staircase and stand on the Sigiriya rock itself, we travelled 1.5km north of Sigiriya rock and paid $5 NZD to climb Pidurangala and look back over to Sigiriya. I think we had the right idea both money wise and view wise. It was a tricky, unmarked climb at points and I don’t know if we would have made it to the top if the young man from our guesthouse hadn’t offered to come with us and lead the way. The view from Pidurangala was undoubtedly worth the extra time and travel – even if we did have to backtrack to Arugam Bay. That night we celebrated our successful day of GIRL POWER sightseeing with an avocado salad, two bowls of fries and freshly squeezed juice. Did I mention that we also managed to each do a load of hand washing and get it dry in between our sightseeing? Yes, we are WOMAN! Hear us ROAR!